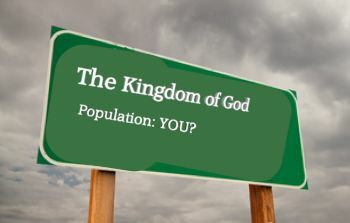 On earth, man has free will which allows him to decide whether he will be a part of God’s kingdom or choose to remain outside of it. The angels also had this choice and Satan along with the angels who followed him, chose to rebel against God. As a result, they were cast out of the kingdom. The Lake of Fire was created for Satan and his angels when they chose to refuse submission to God and it is the eternal home for all those who choose to follow this path. The sad reality is that men who choose not to submit to God will live out eternity there, forever separated from God because of their sin. Sin is rebellion to God and it is the one thing that forbids entrance into His kingdom. Man lost the right to enter when Adam rebelled against God’s command in the Garden of Eden. But God loved man so much that he provided another way for us to be reconciled to Him so that we may still become a part of His kingdom. At the end of time, the door of the entrance to the kingdom of God will be closed forever. After Christ’s return, all those who chose submission to God will live out eternity in the kingdom of God and all those who chose rebellion will be cast into the Lake of Fire. Where will you spend eternity? Choose wisely.